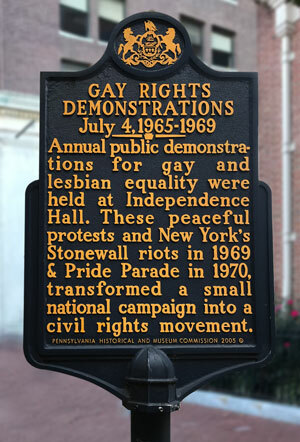 On July 4, 1965, 40 gay and lesbian activists from New York, Washington, D.C., and Philadelphia held the first organized demonstration for equality in front of Independence Hall and the Liberty Bell. At the time, it was the largest protest for gay rights in world history. Chief among its organizers were Frank Kameny (from Washington) and Barbara Gittings (from Philadelphia)—the father and mother of the LGBT civil rights movement. 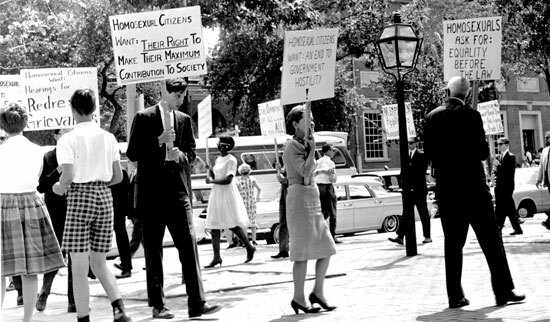 The protests were repeated in the same location each Fourth of July through 1969. By then, the number of picketers had nearly quadrupled. Known as Annual Reminders, the Philadelphia demonstrations paved the way for the Stonewall riot in 1969. In 1970 Kameny, Gittings and other Gay Pioneers suspended the Annual Reminders to marshal support for a march commemorating the first anniversary of Stonewall. The march is remembered as the first New York City Pride Parade. Baim, Tracy. Barbara Gittings: Gay Pioneer. CreateSpace: 2015.